Well, as you might have guessed, this recipe completely floored me. The carnitas are a melt-in-your-mouth explosion of flavour. Encased in the rich, earthy roasted corn masa dough, every bite is a bit of Mexican heaven! Now, I haven’t even begun to tell you how the the sweet, spicy, fruity Manchamantel sauce brightens up every mouthful, but you will just have to make the recipe for yourself. I only have one regret, and that is, that it only made 7 tamales! The next time, I will double or triple the recipe – it is that amazing. I found the recipe in, “Tamales”, by Mark Miller, Stephan Pyles and John Sedlar. If you can find a copy of the cookbook, I highly recommend that you grab one. There is not a better source for creative twists on this humble Mexican treat. I will be bringing these festive treats over to Angie’s Fiesta Friday, where I hope they get passed over, so I can take them back home again for myself…kidding! I hope everyone there loves them as much as my husband and I did! Please come and join the very best virtual blog party on the blogosphere. We’d love to see you there! 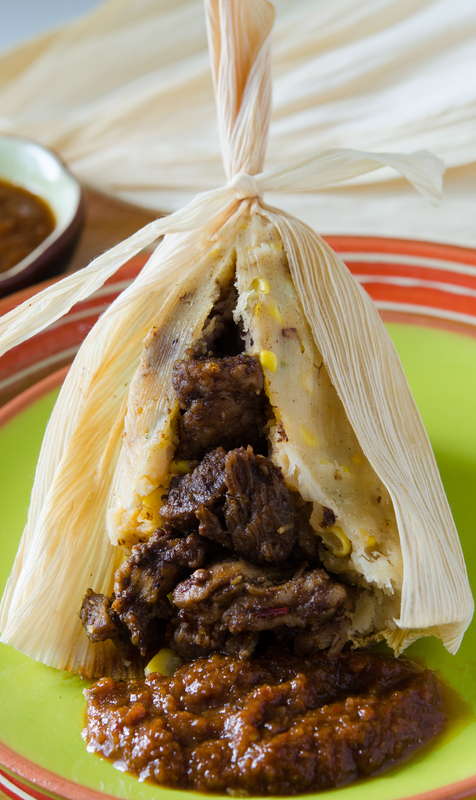 Tamales are a perfect treat for any party or celebration. Place all of the carnitas ingredients except the dough and corn husks in a large heavy-bottomed saucepan. Bring to a boil. Reduce heat to medium-low for about 1 hour, until pork is very tender, and the liquid has evaporated. Fry the cooked pork in the residual fat, over medium-high heat for 5-7 minutes until browned. Set aside and let cool. Drain the corn husks and shake dry. Tear 8 strips, about ¼ inch wide from 2 of the husks and set aside for tying the tamales. Lay out the remaining 8 corn husks on a flat work surface. Measure out a ¼ cup portion of masa dough. Place the dough inside each corn husk and flatten to ¼ inch thick, leaving about 1 ½ inches of exposed corn husk on each end and ¾ inch on each side. Place about 2 heaping tablespoons of the carnitas in the centre of the masa. Bring the sides of the corn husk together, folding the dough over the filling. Fold up the bottom edge of the husk, over the masa bundle. Fold one edge of the husk over the masa and roll until the masa is enclosed in the husk. Twist the top end and tie with the reserved strip of husk. Fill the bottom of a steamer with 2 – 3 inches of water. Bring the water to a boil and place the tamales in the steamer. Cover tightly with foil and a lid, so that no steam escapes while cooking. 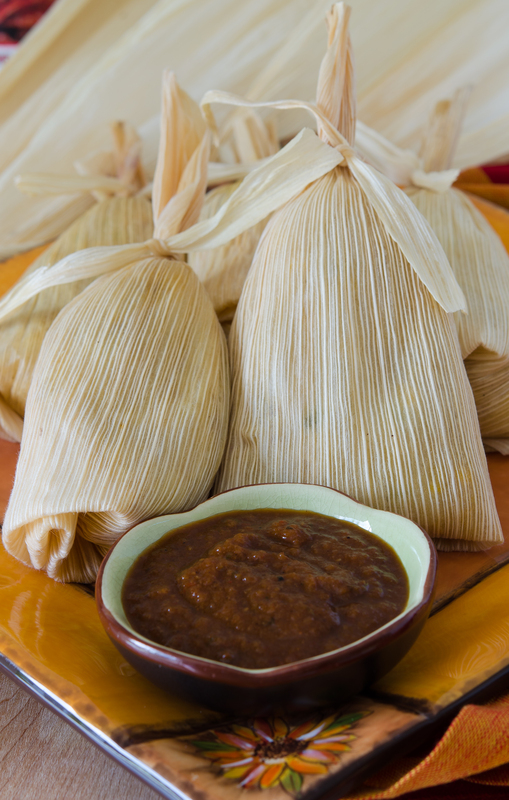 Steam the tamales for 30 – 35 minutes over lightly boiling water, adding more boiling water as needed. The tamales are done when they feel firm to the touch, but are not hard and the dough comes away easily from the husk. Let rest for at least 5 minutes before serving. While the tamales are steaming, prepare the sauce. Ladle the sauce onto serving plates and place the tamales on top of the sauce. With a knife, open the top of the tamale wrappers from end to end. Place the masa harina, salt, and baking powder in the bowl of an electric mixer fitted with a paddle attachment. Add the butter and shortening and beat for 3 minutes until thoroughly incorporated. Add the water and beat for 2 minutes longer; stopping the mixer to scrape down the sides of the bowl with a spatula if necessary. Add the roasted corn kernels and Serrano and beat for about 1 minute longer, until incorporated. Take the masa dough out of the bowl and wrap in plastic wrap. Let rest for 30 minutes at room temperature so the dough can absorb the moist ingredients. Roasting corn gives it a smoky quality that enhances its flavour. Cut the kernels from the cob with a sharp knife being careful not to cut too deeply into the cob. Heat a dry skillet over high heat for 3-4 minutes. When hot, add the corn in a single layer. Roast for 3 to 4 minutes, tossing after 2 minutes, until dark. This sauce translates as “tablecloth stainer” and is a classic sauce from central Mexico. It pairs perfectly with the spicy pork because of its sweet, fruity undertones. Use the leftovers on chicken, sandwiches, egg dishes or whatever you please. Place the rehydrated chiles in a food processor or blender and add the remaining ingredients except for the peanut oil. Purée until smooth. Heat the oil in a large skillet until very hot. Add the sauce and fry at a sizzle for 3 to 4 minutes, stirring constantly. Awesome on their own as a snack, or pair with a green salad for a meal. Lovely little parcels, they must be delicious! A fabulous recipe. Thanks for sharing it with us at FF. Have a lovely weekend. Wow! You know I wouldn’t eat the meat, but the rest of it…amazing…the flavours must be fabulous! Hey Elaine, that’s what’s so cool about tamales! They are so easy to make vegetarian! So very many options! It has been quite a while since I ate tamales, just love it. Your Pork carnitas look wonderful, such great flavor I can only imagine. These tamales look so good! They’re reminding me that it’s been too long since I’ve had one! Thanks so much, Judi! My pleasure to share with the FF gang! By the way, what is the name of the Mexican cookbook that Ginger recommended? It’s called Mexico: The Cookbook. There’s lots of recipes and pictures and it has a bright pink cover! I have not used it yet, Mexican cooking can take some time as you well know. The book overwhelms me with so many delicious sounding recipes. I haven’t had tamales in years but if they are good, they are so tasty and these ones look so delicious. I love the sound of the sauce as well. Must try these! You are too nice, Ginger! But I totally sympathize about the photos! That happens to me a lot. I have stacks of recipes that never make the blog because of bad photos! Oh my goodness, these look so amazing! 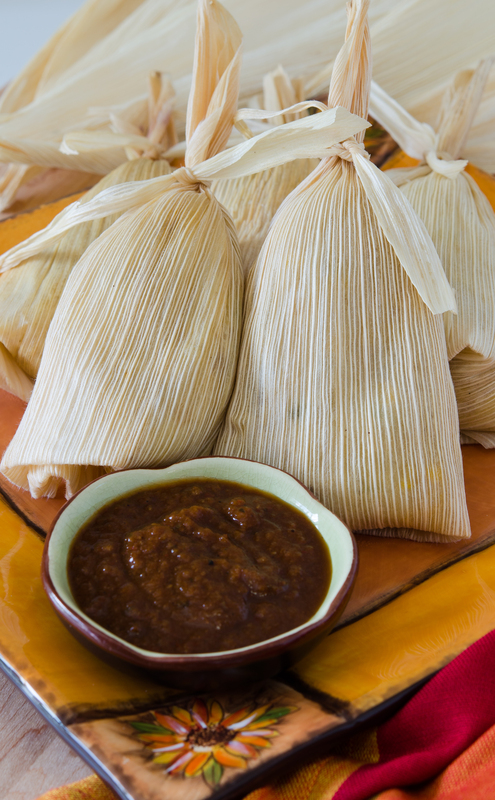 I’ve only made tamales twice (once in a cooking class, and once at home)…they are so much work! I can’t believe how beautifully you tied them…seriously, bravo!! This sauce sounds too awesome. I’m thinking I have to pair it with a grilled pork porterhouse chop. Wow this is one awesome recipe! I can just imagine how delicious it is to bite into these tamales, 7 would definitely not be enough! See, this is why I follow blogs! I’ve never heard of Manchamantel sauce! Love it!!! Great food! I’m with you Mimi! This is one of the best things about blogging…I have learned so much from other bloggers too! It is very curious but I was checking fours at the supermarket last Saturday (I wanted to make arepas) and I came across the name “carnitas” the very first time in my life… Now, I come here and I have the recipe and some beautiful photos… the look amazing, I wish I could have at least one for my dinner tonight! Isn’t that funny how that happens? Now you will probably run into carnets again and again – that happens to me too! It has been too long since I had tamales. I had a colleague who would make them and sell it to us for lunch to make some side money. Your recipe with pork meat and manchamatel sauce sounds/looks so~ good that my mouth is watering. Yum mmm mmm!